Electrical labels like voltage markers and arc flash labels provide quick identification of potentially dangerous hazards to employees and other individuals that may not be aware of the risk. They are perfect for marking electrical boxes, conduit, circuit breakers, equipment and other electrical components.These quality voltage markers provide high visibility with a rugged, pressure-sensitive adhesive vinyl. 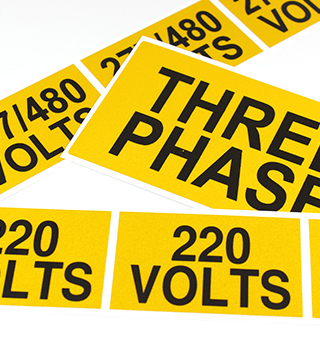 We offer standard electrical labels as well as voltage markers with a reflective surface, making them great for visibility at night or in low lighting situations. 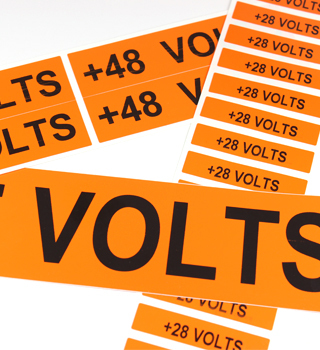 These bright orange voltage labels are pre-printed with common voltage readings and are ideal for the identification of electrical power sources such as circuit breakers, cable trays and conduit. Industry standard reflective labels are prefilled with the most common voltage legends printed on highly reflective material that is visible in bright and low-light conditions. 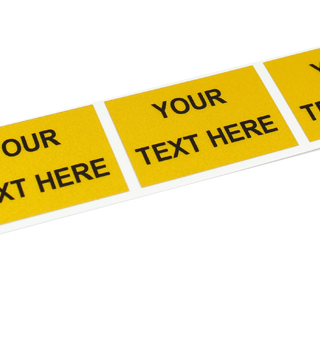 With our custom text reflective labels, you can choose your own legend that will appear on this highly reflective material that is visible in day and night conditions. 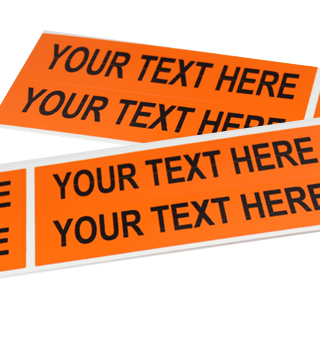 Choose your own text to be printed on these bright orange voltage labels that are typically used for identifying high-voltage electrical sources and electrical hazards.